Super Star Rajinikanth's Enthiran sequence movie 2.0, written and directed by Shankar, previously directed super hit blockbuster movie Enthiran on 2010. B. Jeyamohan also is a part of a wrtting story. Bollywood Very Fam actor Akshay Kumar doing the important role in this film. 2.o movie produced by Lyca Productions. Recent Buzz says 2.o movie satellite deal closed a huge price. Yes! 2.o production company Lyca Productions closed the deal with ZeeTv in the amount of 110 Crore Indian rupees. This is a huge price in cinema industry in India. 2.o going to release in three languages like Tamil, Hindi, and Telugu. We all very known this is a very big budget movie in an industry of Indian Cinema around 4 billion Indian Rupees. Superstar Rajinikanth playing dual role as Dr. Vaseegaran and Chitti, Amy Jackson doing female lead role opposite with Superstar, in the Previous version, Aishwarya Rai did romantic role with Rajini. 2.o music scored by oscar winner A. R. Rahman, Anthony doing film cutting and joining part, Nirav Shah handling camera in this 2pointo movie.Subaskaran Allirajah is taking care of financial part under his banner name of Lyca Productions. Stay tuned for more updates about Superstar Rajinikanth's 2.O movie only at Tamil Cinema Profile. 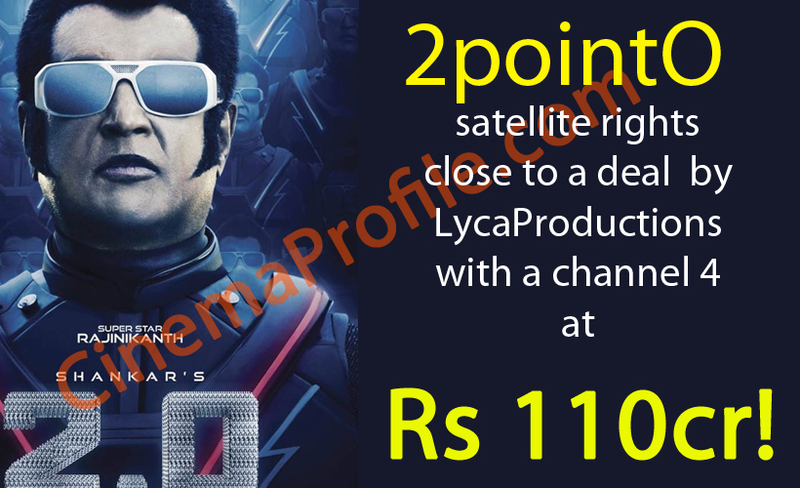 Write & Share about "2pointO Satellite rights deal closed at highest price? ZeeTv | 2.0 (2 Point O) Tamil Movie News | Cinema Profile" !